The key recommendation of this Task Force is that there needs to be better connectivity among various parts of the city. Buses play a very important role in urban transport, at very least providing last mile connectivity for all passengers. The choice of the public transport system will play a crucial role in the development of the city. As highlighted in earlier reports of the BMTC, the choice that Bangalore has is one between an organised public transport system and one where public transport becomes highly de-regulated and fragmented. A feasibility study has shown that Bangalore would benefit greatly from the implementation of a Grid system. It has also shown that such a system can be realistically introduced, at least from technical and economical viewpoints. Grid concept of transportation supports Mr. Parameshwaran’s model as well. It is a synchronised metro and trunk route system. Hence what is required to implement is not money – the investments are rather reasonable – but factors like political will, coordinated effort, popular support and enforcement will play an important role. The undertaking of such a system would also provide the necessary feedback and experiences for successful continued reforms. The key recommendation of this task force is for the implementation of a grid system of buses in order to improve connectivity to all parts of Bangalore. Improved connectivity within the bus system and also between the different modes of transport will help to increase the market share of the BMTC of passenger trips. The Grid System of Buses is designed for implementation in radial cities much like in Bangalore. A very similar system is followed in Paris and the route map of the system there is attached with this report (refer Appendix H). The Grid system divides a radial city into grids (or blocks), which are served by north- south, east- west and diagonal bus routes. This ensures that all parts of the city are well connected through a spider web of linked bus services. 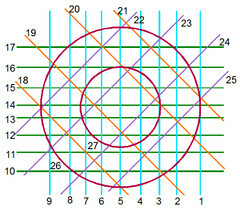 Much like a spider’s web, the grid system will facilitate connections on parallels (as highlighted above) in the city and also along concentric circles depending on the size of the city. The Grid System of Buses has to be implemented with an excellent feeder bus system that ensures that a substantial majority of commuters do not have to walk more than 500m from their houses to catch a bus. The Grid System however will have to function in a complex with existing systems till such time there is no defined need of having a central cityterminus system. This is because the three terminals are located at the centre of economic activity of Bangalore based on the fact that these areas historically did provide the best economic and trading opportunities. However, over a period of time, it will be necessary to re-adjust routes going to the centre of the city without adversely affecting connectivity. While recognising the need for a Grid System of Buses, this Task Force also recognises that it is no panacea for all that ills the transport sector in the city. This system will be effective only subject to many conditions that will help ensure that connectivity is better through all areas in Bangalore. The implementation of a Grid system has to be simultaneous with a massive publicity campaign to educate people on the system and how it will benefit them. At the same time, it is crucial that detailed maps are made available on details of every route and every service with details on feeder services also. Route maps should be ubiquitous in their presence at ALL bus stops, inside all buses and in a BMTC published time table published every year like the Indian Railways time tables. It is also important that all routes have to come into implementation at the same time. Introducing some routes while ignoring others will not help increase market share. At the same time, a massive training exercise must be undertaken among all staff of the BMTC especially those who come in contact with commuters: conductors and drivers. The success of the grid system will rest squarely on the enthusiastic support given to it by this large group of employees. It is also important they recognise the need of a new system and recognise that though it might be slightly more difficult to navigate, is a system that will benefit all commuters. The grid system of buses has a large number of advantages in a radial city. The spider-web that is formed through a grid system connects two points in the city through the shortest possible route possible. In case there is no direct route possible, an individual can make a single change on the bus in order to use two clear straight-line routes to get to their final destination. Though this does not always trace the shortest route, when compared to the hub and spoke model, it on most cases traces the shortest route between two points. The only major exception to this rule would be when the route is through one of the three city centres. However, given the coverage anomaly of the three different bus stations, this is again subject to the caveat that it applies only when the two points are in the same zone. The main advantage of a Grid System is that it provides better connectivity than a hub and spoke model that has been used till date. In the absence of destination oriented model, a commuter may have to make a minimum of one change over. Additional fare to be shelled out could be one more disadvantages of this system. Praja Admin Note: Information not available. The current system of buses in Bangalore is a destination dominated Hub and Spoke Model with three hubs in the city centre. The three hubs are connected to various parts of the city and beyond through a destination based bus system. All users are therefore expected to make changes only at one of the three major bus terminals. This has the advantage that the method is simple and that people can easily go to one of the three interchanges and catch a connecting bus from the interchange. This system worked well when most of the commerce and business activity was concentrated in these three areas. However, the limitations of a destination based bus system and the lack of a serious alternative transport system has meant that the city of Bangalore has evolved as a multiple centre town with each of these centres now acting as mini-hubs on their own. Together with the increase of population, these mini-hubs have effectively grown to a size not dissimilar to that of the major hubs approximately ten or fifteen years ago. The creation of multiple centres has meant that the hub and spoke model now services mainly those people who have their offices around the three centres. The people that are serviced well using this method are mainly government offices, schools and colleges in that area and employees of private establishments in the city centre. While most of the city has been growing at a rapid pace, the BMTC has maintained a steady market share in passenger trips through servicing this clientele that has also grown thanks to the greater demands in those inner city areas. Unlike other cities in the country where public transport has fallen by the wayside, the BMTC has managed to retain its market share through the years through retention of the existing system. However, the limitation of the Hub and Spoke Model is that it has not allowed people apart from the core constituencies highlighted earlier to use public transport. Even areas that are near the city centres are sometimes not connected due to the anomaly that buses in a particular zone do not normally cross over into another zone. This was related to the fact that buses were operated out of a particular depot and crossing into another zone would make the bus move into a different depot area, which was generally not encouraged. In addition, the Hub and Spoke Model has created a very large number of routes (over 2,000) with just over 3,000 buses. This has meant that the frequency of bus services to most areas is poor especially those on the fringes of the city. However, as these services converge into the city (at a distance of around 4-5 km from one of the terminals), the frequency of can be as high as one every thirty seconds. This also increases congestion within the city centre as all buses are routed to converge on a particular destination. Inevitably, this increases travel time as buses are crowding out the existing road infrastructure in the city centre. The Modified Hub and Spoke Model is a variation of the hub and spoke model. Presented by Mr. Parameswaran, it identifies ten key points at the fringes of the city creating direct bus services from all these key points to every other key point. And at the same time, feeder services to get people to these key points. The advantages of the system are similar to the Hub and Spoke Model. However, it has the weaknesses of the earlier system as well especially with the fleet requirements being quite large and therefore difficult to implement. Pavements are very poor and in most localities, the uneducated and knowledgeless corporators widen the roads at the cost of taking away the pavement space. Good pavement even with narrower roads is OK. One way can be introduced on narrower roads without sacrificing the pavement space. This will increase the pedestranisation since there is no one way for pedestrains. Just today I had to accompany few of my relatives to bus stop and there was no pavement at all. We had to walk on the side of the road where most of the vehicles were parked hapazardly. It makes a very bad experience to walk till the bus stop which is an unattractive factor for using buses. Bus stops are never marked in many places and buses do not stop in bus stops in many places. We have to stand where the people are standing rather than where the bus stop is located. Most of the bus systems in the world uses the transfer concept. For 1 transfer, this much cost, for 2 transfers this much cost and so on. For Grid bus system, transfers concept is a must. Otherwise, fare will be unduly high and will not attract passengers to the system.